Today I have some fantastic projects to share with you. 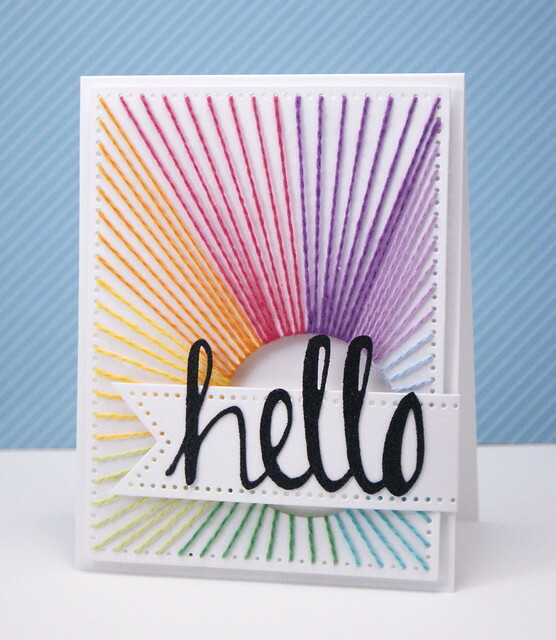 Yainea created this first card using our Dotted and Simply Said Hello Dies. I love the stitching here. It adds so much detail and is a great way to highlight the sentiment! 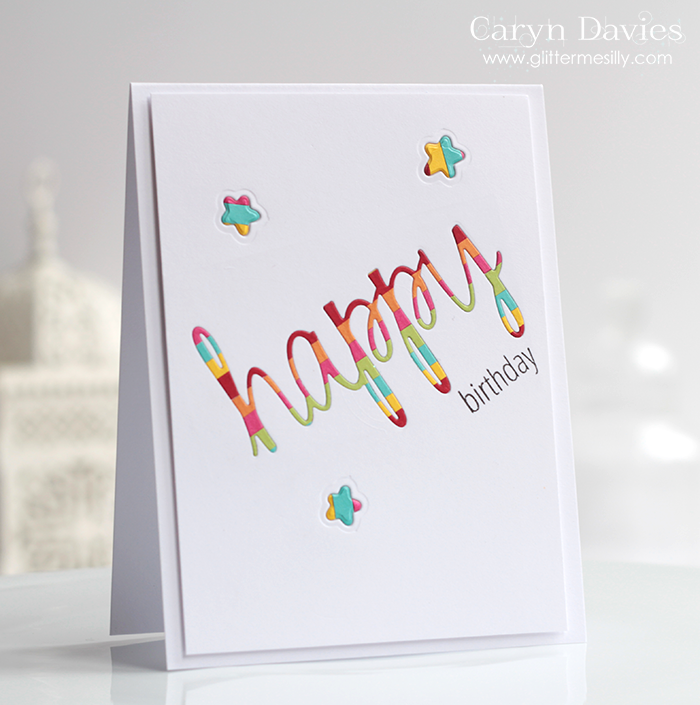 Caryn Davies created this next set of cards using our So Happy and Many Thanks stamp sets. 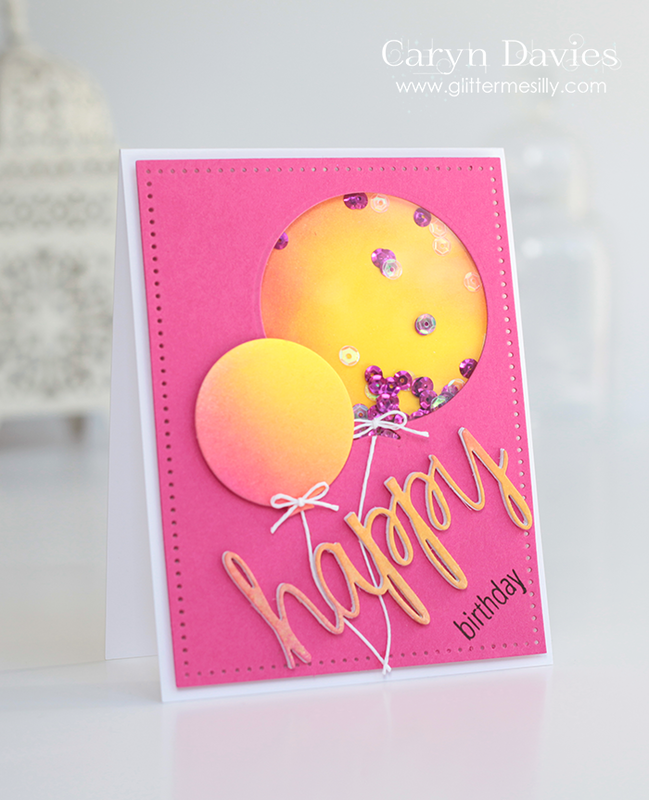 She embossed the pinked circle using our Avery Elle Signature die. Embossing with dies is a great way to get more use out of your dies! This card set is just so clever! 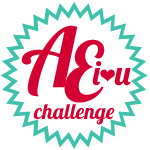 Did you know that today is the start of a new challenge over on the AEI♥U Challenge Blog and that if you are selected as the winner you win an Avery Elle stamp set of your choice? The theme for this challenge is Gold and as usual the the challenge team's projects are amazing! Today I am sharing two terrific projects by Heather and JJ. They are seriously fantastic! 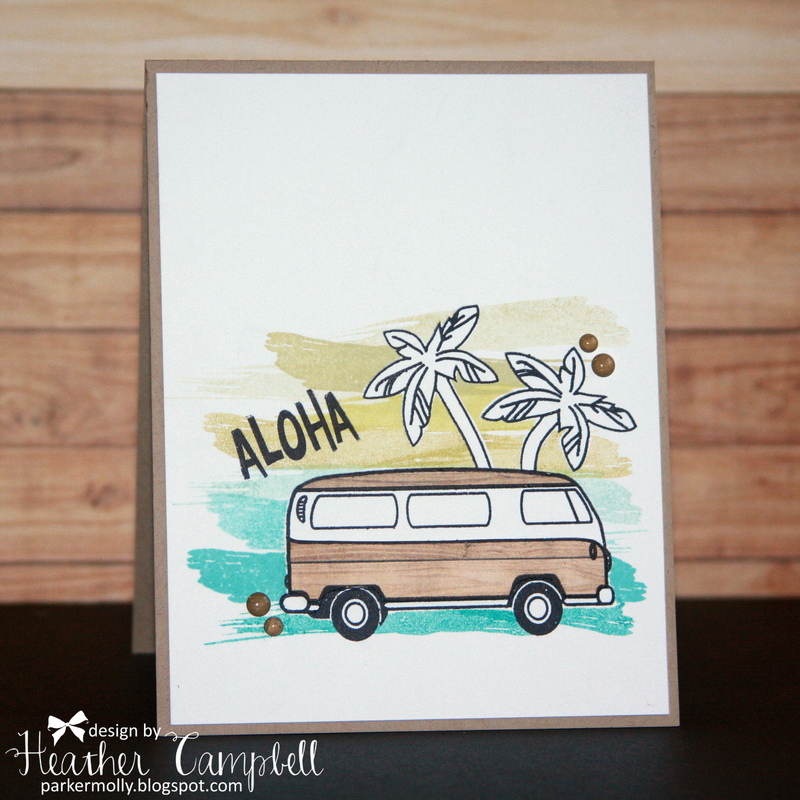 Heather created this card using our Surf's Up clear stamp set. I love how she masked the images and used the strokes from our Brushed stamp set to create a fun background. It is such a fantastic combination that I would have never thought of on my own. JJ created this sweet card using our Avery Elle Signature & Dotted dies as well as a sentiment from our Many Thanks stamp set. I love how bold and graphic this is. Right up my alley!! Today I have the pleasure of sharing this fabulous layout that Maska created. Can you find where she tucked in the various tags from our Gift Tags stamp & die set? She shows how you can use these for more than just tags! Such a cool idea. Today I have some fun cards that were created by Chunyuan to share with you. She stamped images from our Balloons stamp set to create a Happy Birthday greeting in the first card and used them to create a custom background in her second card. I love how she used our Dotted Die to create an angled mat for images from our #smile and Party Animal stamp sets. Be sure to stop by Kasia's blog because I know that she has something amazing in store for you over there today too! Happy Monday! Today I have some adorable projects to share with you. Caryn Davies used our new Dotted dies to create this stitched panel on her card front. What a great idea. She stamped images from our Sending You and Red & Goldie stamp sets onto it. I just love this card! 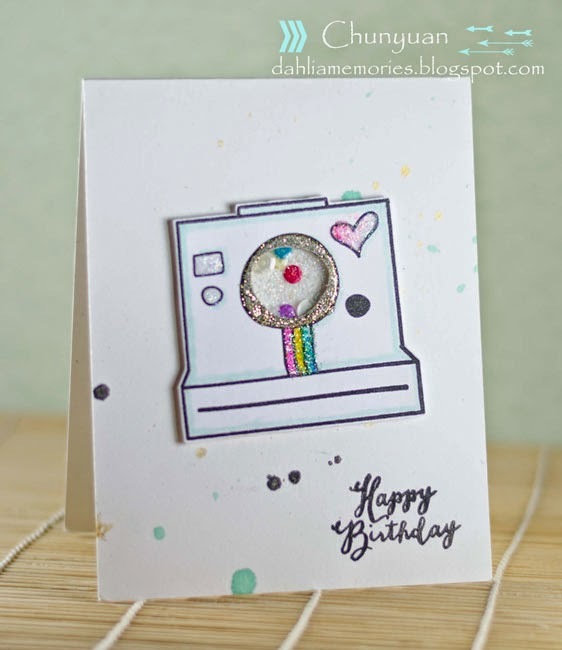 Yainea created this fantastic card using our Simply Said Happy stamp and die set. How cute are the balloons from our Party Animal and Balloons stamp & die sets tied to the sentiment?!! Brilliant! 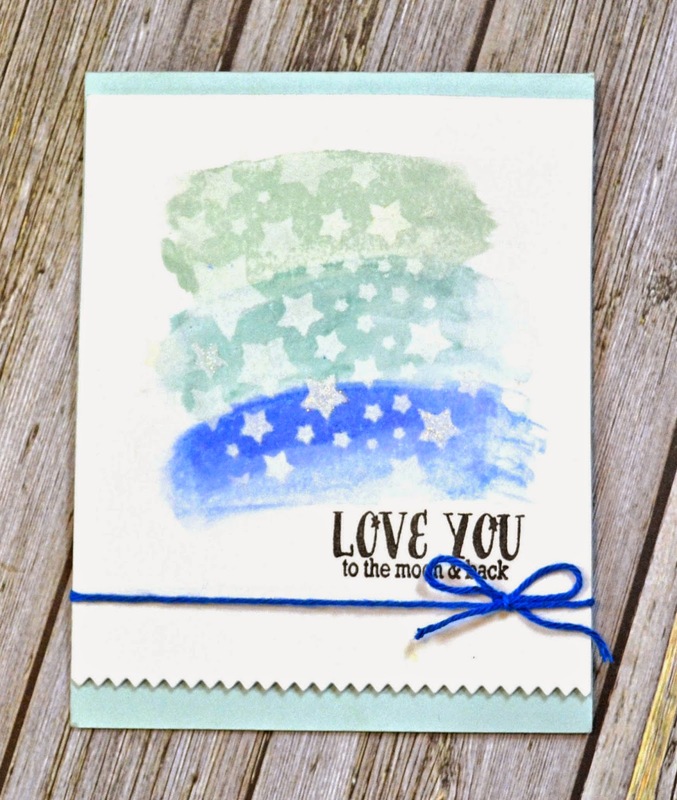 It's the last day of Scrapbook Adhesives by 3L and Avery Elle week! This week the Avery Elle design team has been playing with some of the most popular products from Scrapbook Adhesives by 3L such as their 3D Foam, E-Z Runners, Adhesive Sheets, etc. After visiting here, be sure to check out the Scrapbook Adhesives by 3L blog for even more inspiration using both companies products! Don't forget to comment on the blogs throughout to week to be entered to win a fabulous prize! I created this card by using a star stencil by UmWow Studio and sponging our Pure White ink over the top. After that, I took a paintbrush and watered down and washed some ink from our Sea Glass, Sapphire and Aquamarine reinkers over a piece of cardstock. I think the sentiment from our Written In The Stars stamp set really ties everything together. After adding some twine and adhering the card panel to the front of the card using Scrapbook Adhesives by 3L 3d foam squares (these are really great if you haven't tried them before) the card was complete. Thanks for stopping by to take a peek. 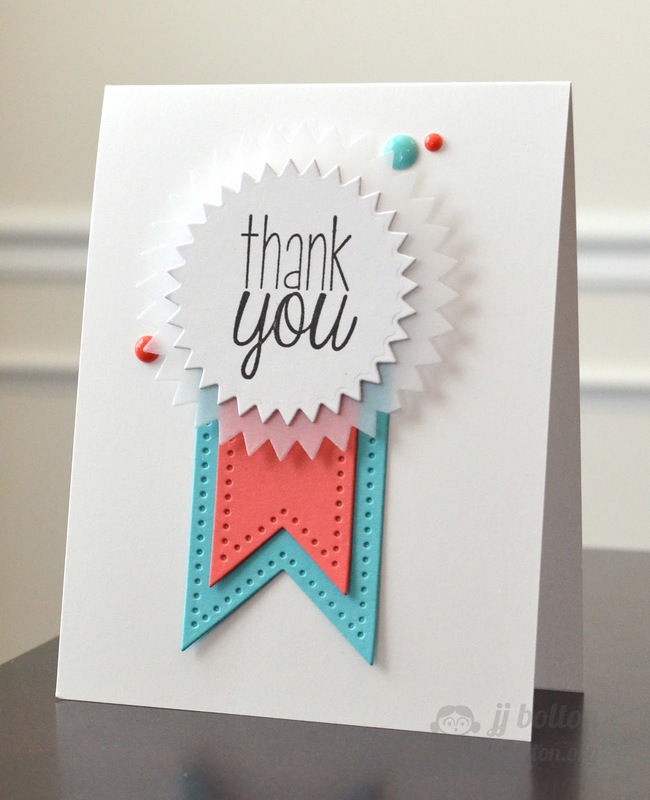 Don't forget to stop by the Scrapbook Adhesives by 3L blog for even more inspiration from their design team! Thanks for stopping by all this week to check in on the festivities! We hope that you have enjoyed it as much as we have. Have a great day! 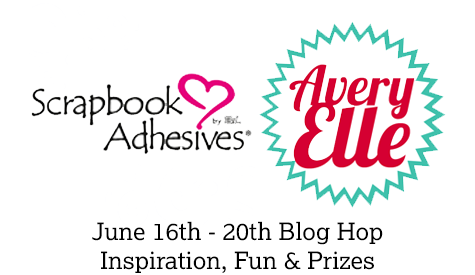 It's Scrapbook Adhesives by 3L and Avery Elle week! This week the Avery Elle design team is playing with some of the most popular products from Scrapbook Adhesives by 3L such as their 3D Foam, E-Z Runners, Adhesive Sheets, etc. After visiting here, be sure to check out the Scrapbook Adhesives by 3L blog for even more inspiration using both companies products! Don't forget to comment on the blogs throughout to week to be entered to win a fabulous prize! 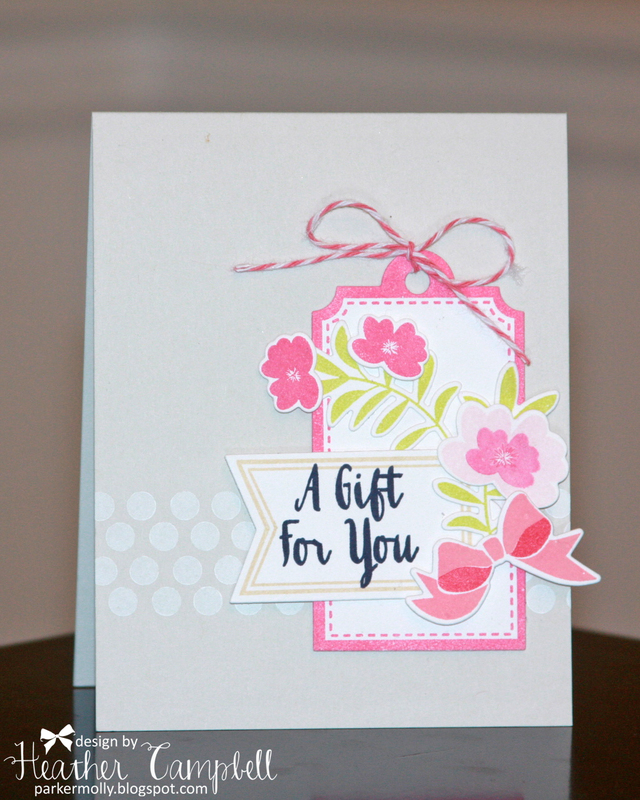 Heather created this fabulous card using our Gift Tags, Laurels and Petals & Stems stamps and dies. That sweet polka dot border is from our Woodgrain and More stamp set. She adhered all the little bits and pieces to the card front using Scrapbook Adhesives by 3L adhesive. I adore this gorgeous card!! JJ used Scrapbook Adhesives double-sided adhesive sheet to apply glitter to vellum. She used Modern Leaves dies to die cut the adhesive sheets and applied them into the shape of a butterfly. The sentiment is from our Brushed stamp set. This is so creative and beautiful!! Thanks for stopping by to take a peek. 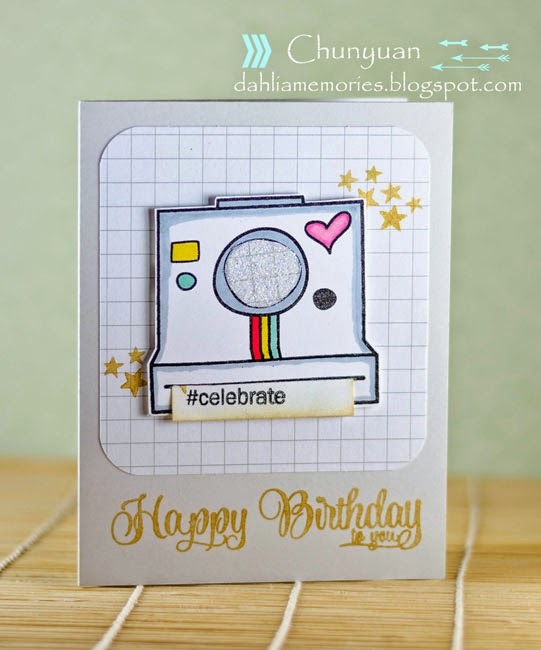 Don't forget to stop by the Scrapbook Adhesives by 3L blog for even more inspiration from their design team! Be sure to stop by tomorrow for more fabulous inspiration! Have a great day! Maska created this project using our Gift Tags Stamps & Dies and adhesives from Scrapbook Adhesives by 3L. I love all the layers and texture in Maska's page. It is so great! I have page envy! Ha!! Chunyuan used products from both companies to create this festive happy birthday card! I love the way she popped our #smile camera off of the card front using Scrapbook Adhesives by 3L 3D Foam tape!! Chunyuan used more adhesive to adhere her stamped card front and camera image to the card base. I really love the high quality of their tape and adhesives. Chunyuan knows that her hard work will stay put using these products! 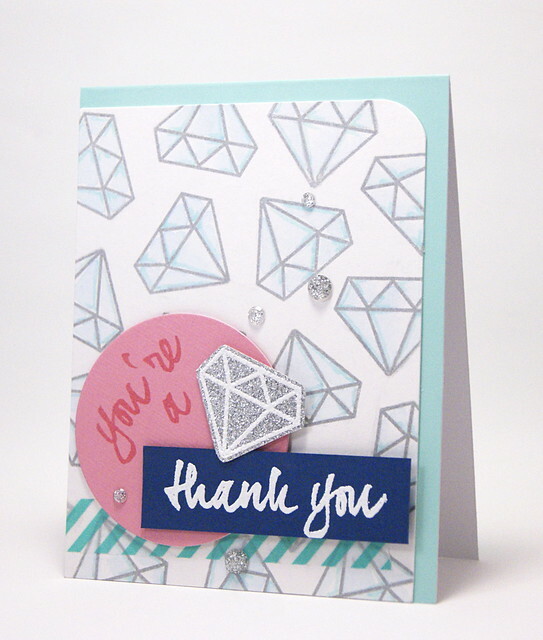 Kasia used our Avery Alpha's, Count on It and Pinked Elle-ments dies to create this fun card front. I just love the watercoloring! Don't you love the way she popped the front card panel up to create depth? 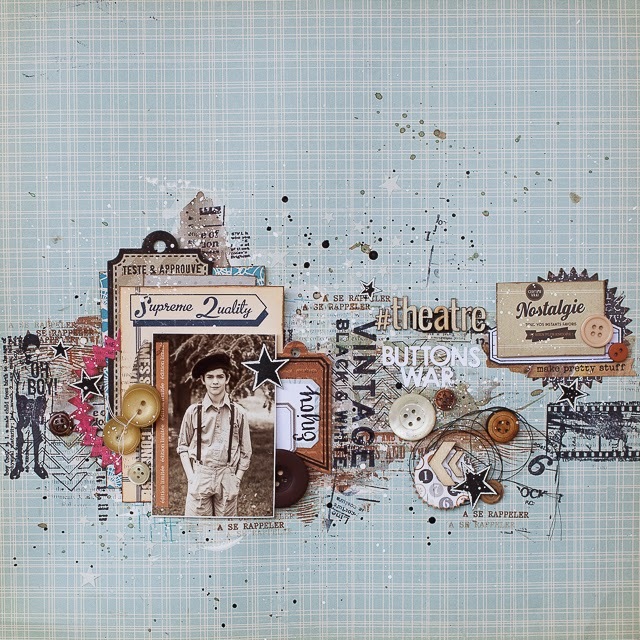 Scrapbook Adhesives by 3L 3D Foam is perfect for creating this look! It's Scrapbook Adhesives by 3L and Avery Elle week! This week the Avery Elle design team is playing with some of the most popular products from Scrapbook Adhesives by 3L such as their 3D Foam, E-Z Runners, Adhesive Sheets, etc. After visiting here, be sure to check out the Scrapbook Adhesives by 3L blog for even more inspiration using both companies products! Don't forget to comment on the blogs throughout the week to be entered to win a fabulous prize! 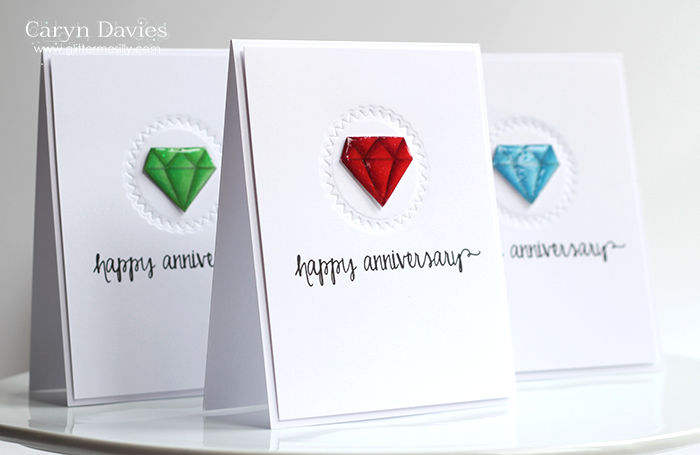 Caryn created these two fabulous cards using products from both companies. 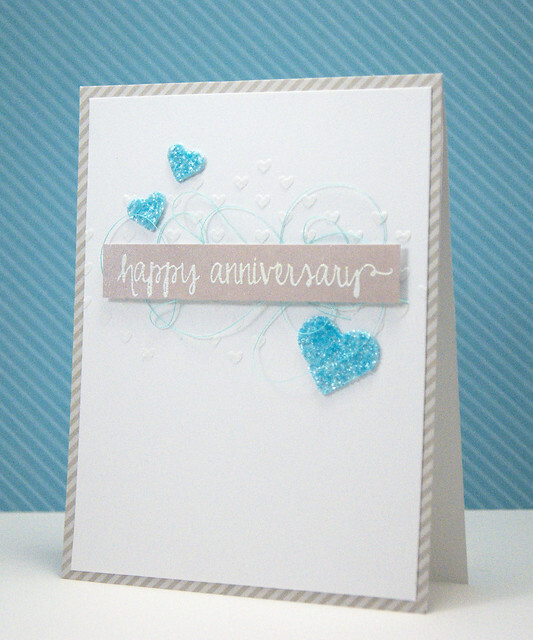 Scrapbook Adhesives by 3L make great products for adding embellishments to the front of cards! I love how bright this first card is!! 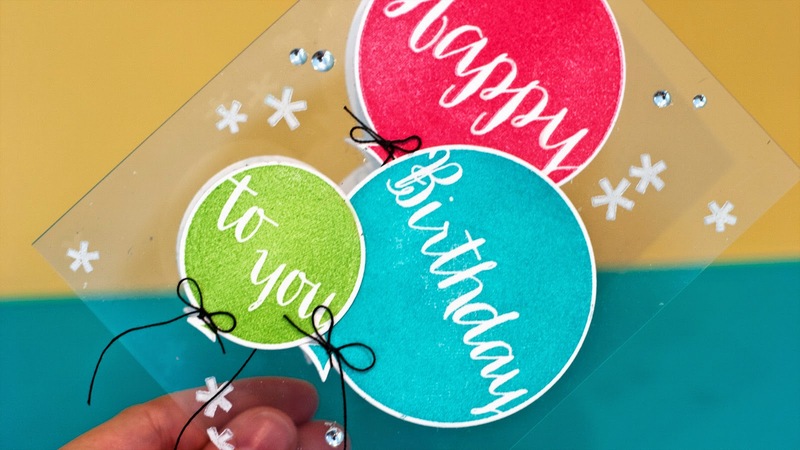 Caryn adhered die cuts from our Dotted, Balloons and Simply Said Happy Elle-ments die sets to the front of her card base using Scrapbook Adhesives by 3L adhesive. The quality is really great! Yainea created these two cards using our So Happy, Many Thanks, Red & Goldie and Woodgrain and More stamp sets. I adore all the cute details that she was able to add to her card front. Using high quality adhesives like these gives you peace of mind since you know that all the little details on the card will stay put!! Today we have a treat for you. 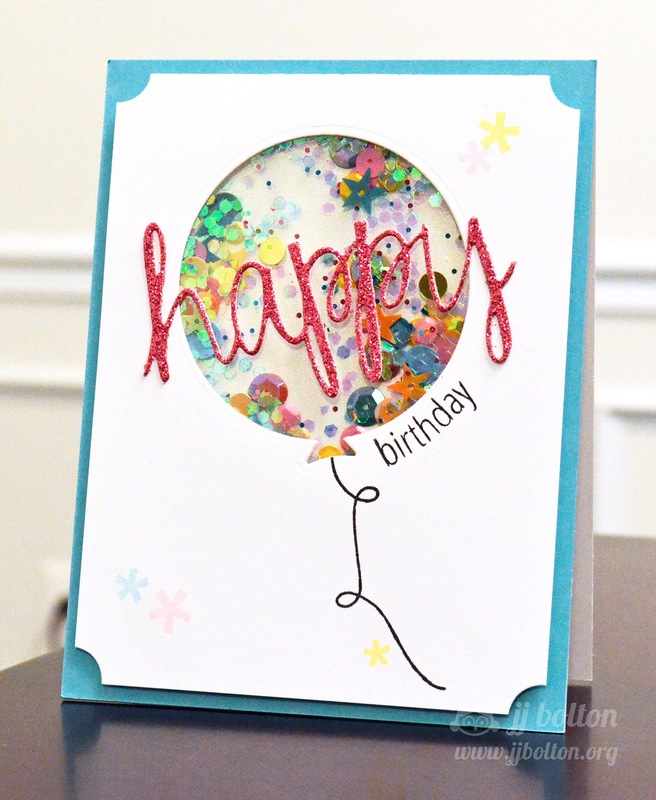 The amazingly talented Jennifer McGuire created this fun card using our new Balloons stamps & Elle-ments dies. She used the dies again to create a place to write a sentiment inside the card. Genius!! 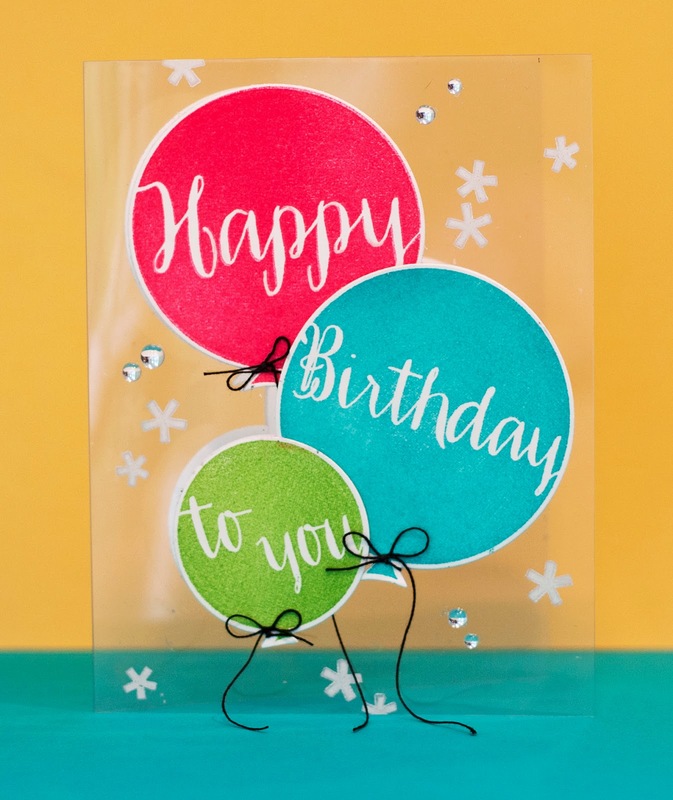 Be sure to stop by Jennifer's blog today because I heard that she just may have a video for us showing how she created this fabulous clear card! Thanks Jennifer!!! Balloons, Balloons and more Balloons! Today I have some festive cards to share with you. 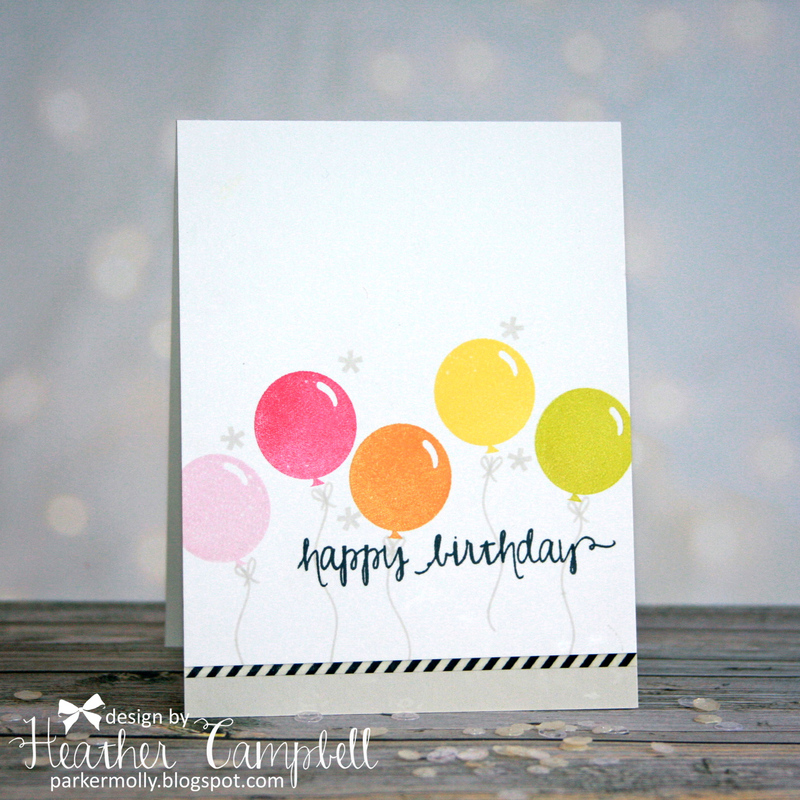 Heather created this card using the happy birthday sentiment from our So Happy stamp set. 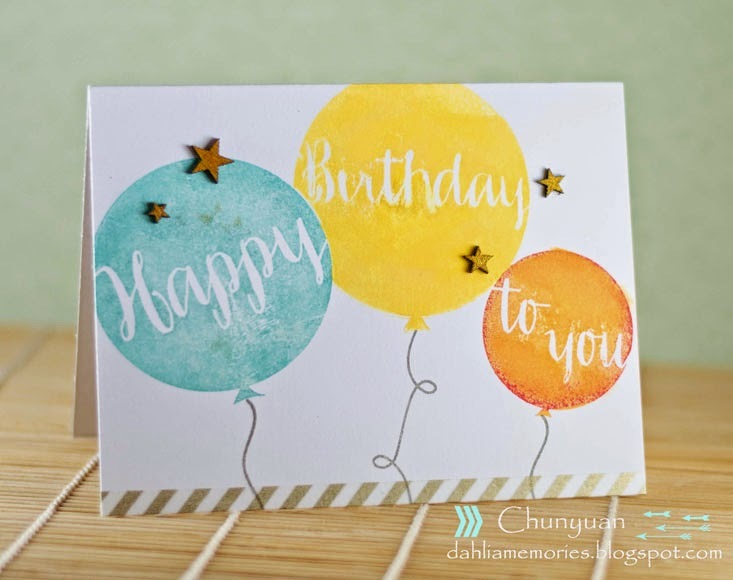 The balloons and confetti stars from our Balloons stamp set are a perfect match for the sentiment. So cute!! JJ created this shaker card using our Balloons and Simply Said Happy Elle-ments dies. 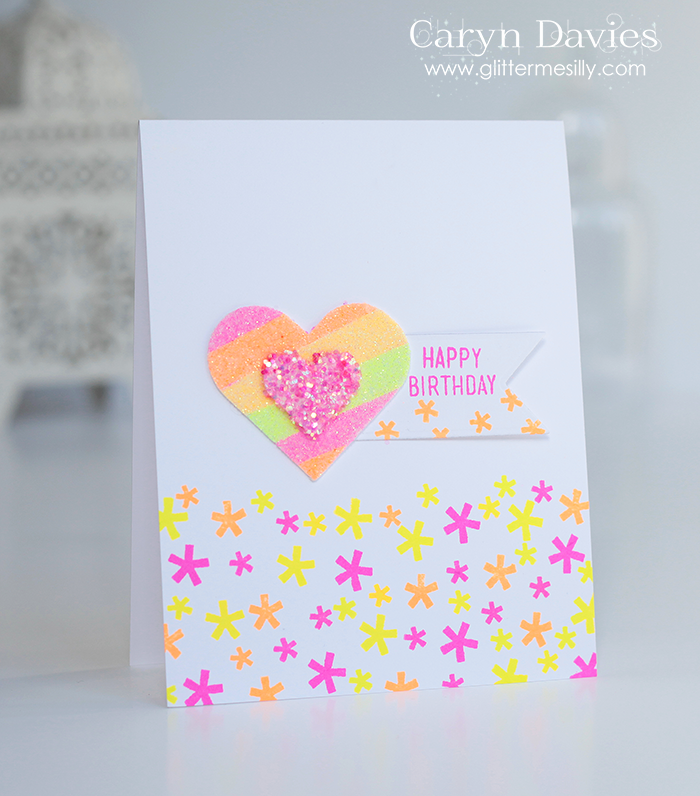 The birthday stamp is from our Simply Said Happy stamp set. JJ shows how many of the sets from our new release can be mixed and matched together! I love it! 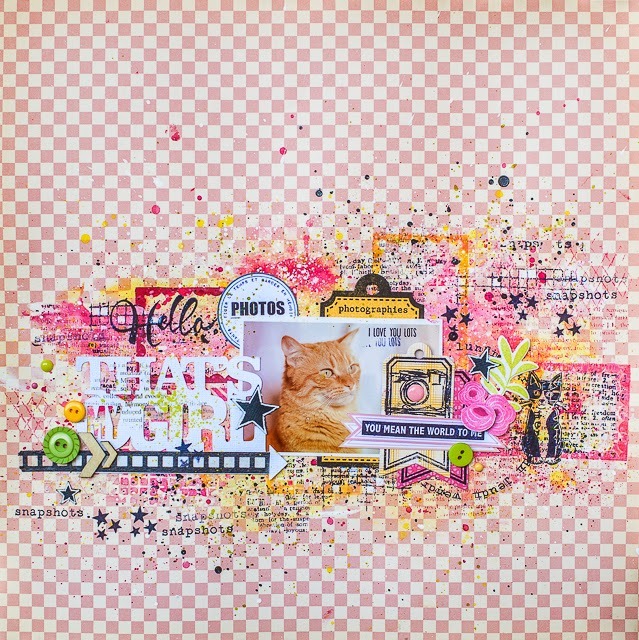 Maska created this page using our new Avery Elle Signature Elle-ments Die Set. I love how she used the dies to cut out the photo and mat it! Isn't it gorgeous? Maska shows how versatile these dies are. They work so well for journal cards, scrapbook pages, project life, greeting cards and anything else you can think of!! I hope you are all having a great week so far. Today I have the pleasure of sharing some projects by Chunyuan and Kasia. 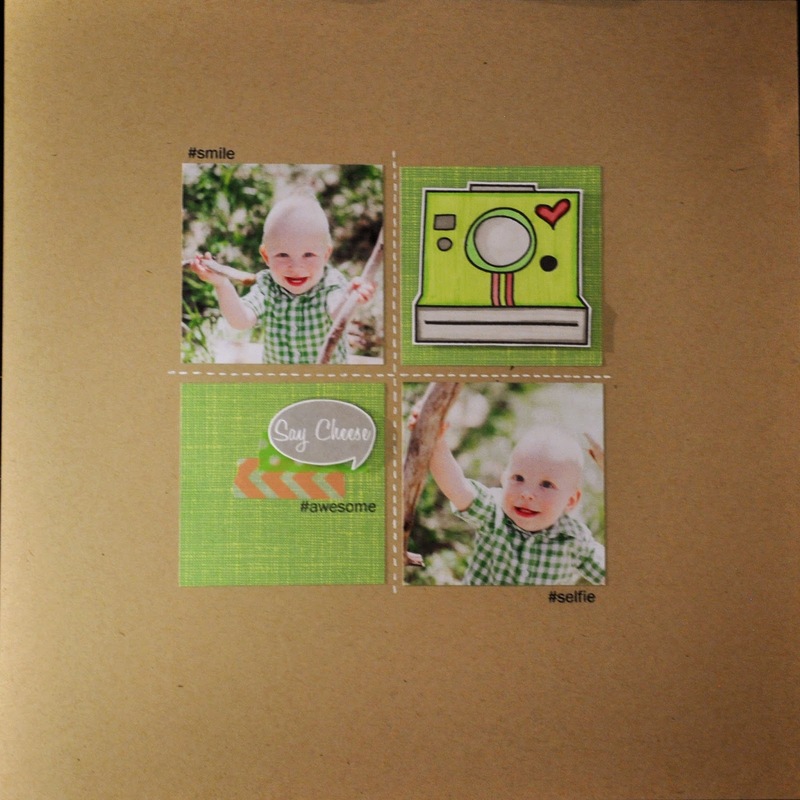 Kasia created this cute layout using our new #smile and Picture It Stamp Sets. I love the way she used the hashtag sentiments and camera to highlight those adorable pictures!! 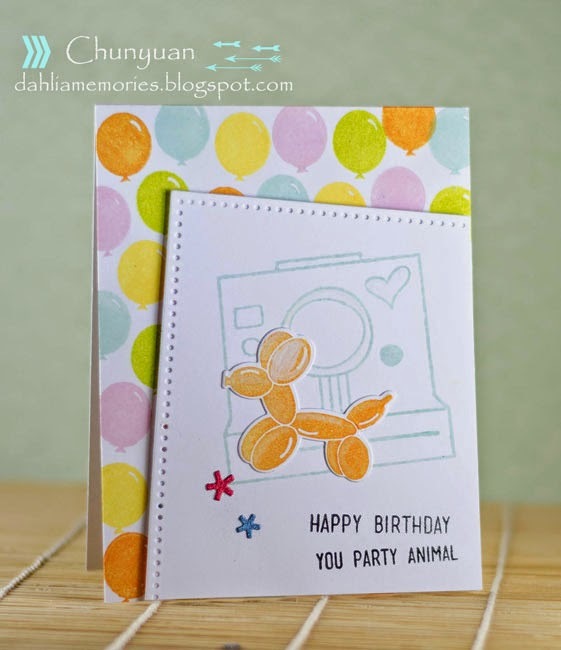 Chunyuan created this first card using our Sending You stamp set and Dotted Elle-ments die. I love how she stamped the paper airplanes from Sending You and Air Mail together on this card. So cute! 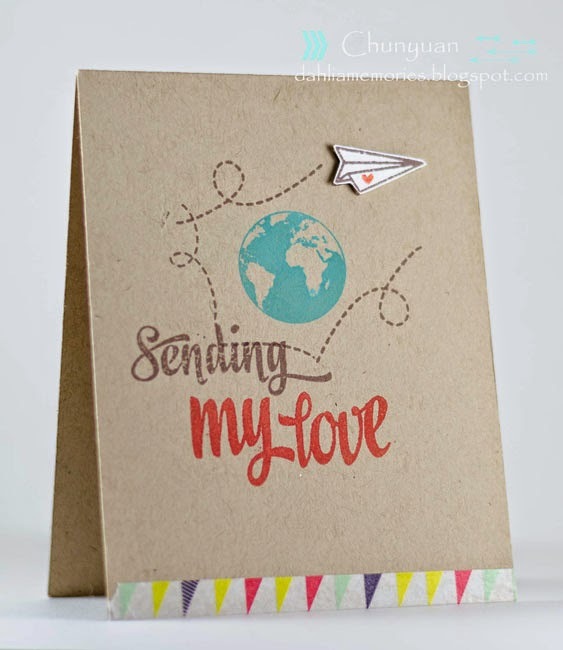 Chunyuan stamped the sentiment, airplane trail and paper airplane from our Sending You stamp set along with the globe from our Love Notes stamp set in this next card. So clever! Today I have the pleasure of sharing two amazing projects from Yainea and Caryn. I just adore both of these so much! 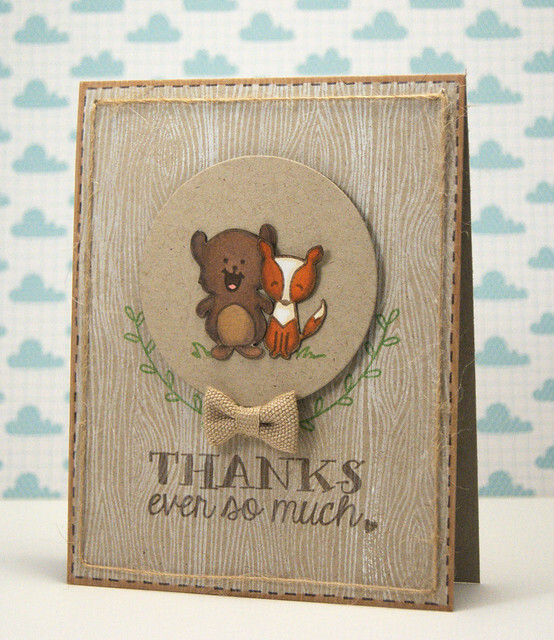 Yainea created this fun card using our Many Thanks stamp set. I love how she used the gem image from the set to create a backdrop for the sentiment. The geometric layout plays upon the angles of the image so well! 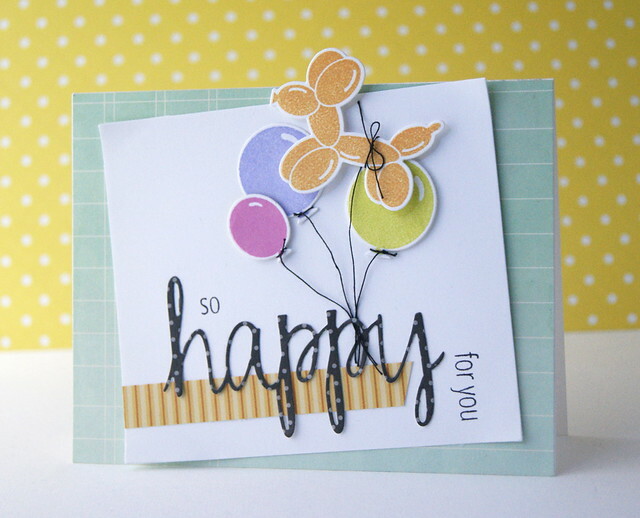 Caryn created this fabulous inlaid card using our Simply Said Happy stamp and die set. 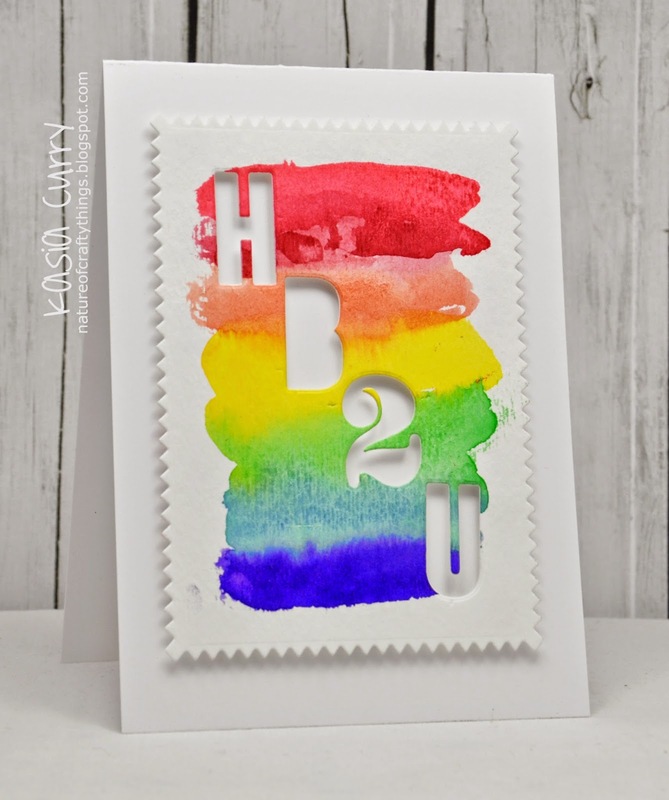 I love the rainbow of cardstock colors she used. This is a happy card indeed! 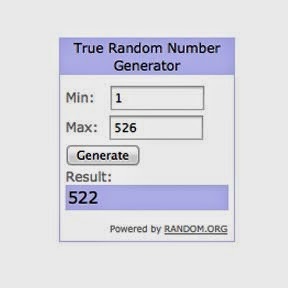 The winner of our Summer 2014 blog hop is Denise Bryant for her comment on Maksa's Blog Post . Great label and card! I love the Dotted Die you used on the label, and I can't help but notice your very beautiful cat! It's Our Summer 2014 Blog Hop!